Rune short sword formerly held by Kchaketch. It is only 2’6" in length, with faint runes on its blade only. 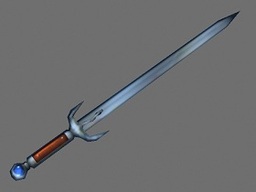 This is the sword that kept Kchaketch alive for more than 5 Wolfen lifetimes. It is known to be an assassin’s blade. CrIsis discovers the true powers of Mindprancer, when, on Dragon’s Roost, the syvan Darksong almost kills Tyvernos, and disappears. Please see the log I’m a Rainbow Too. This runesword is now in the possession of the Tri-Arcanum Magic Guild, a gift to Kel-ed from Xerx’ses. Please see the log The Lopanic Games:All Things End.